What can hiring a fitness trainer do for you? "" The thought of hiring a fitness trainer may sound like pure fantasy. That’s something that A-list celebrities and athletes do, right? Even for us everyday folks, hiring a fitness trainer may be worthwhile. Yes, there is always a cost associated with it and yes, committing to fitness at this level could initially be intimidating but stick with me. Let’s look at the benefits. Not every fitness trainer is an overly energetic, wake you up for a 5:00AM run then yell at you to “PUSH HARDER” type. Whatever your conception of a trainer is, rest assured that your options will be far more varied. There are trainers out there for every disposition and every fitness level. The only thing that unites them is a desire to help their clients meet their goals. Goals are tricky. On the one hand, it’s great to have a target and to keep you accountable. However, some research suggests that, when done carelessly, sharing your goals with others actually makes you less likely to achieve them. Telling a friend “I’m going to eat healthier” gives the same rush as actually following through. With a trainer, you will amplify your ability to do the former. You will work to set SMART goals (specific, measurable, achievable, relevant, time-limited). With your trainer there to keep you in line, these SMART goals will become easier to reach. If you’re anything like most amateur fitness enthusiasts, entering the gym is an exercise in confusion and wasted time. 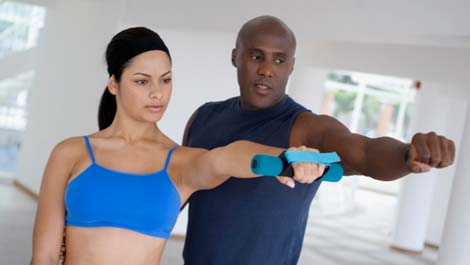 Trainers will provide you with the tools to create personalized workouts that target your needs. No more going to the gym without a plan and with poor form. You’ll get the most out of each trip by knowing what to do and how to do it.